74- Screw you guys, I’m going home. I’m surprised I had time to finish this before work. My new job is pretty good so far. 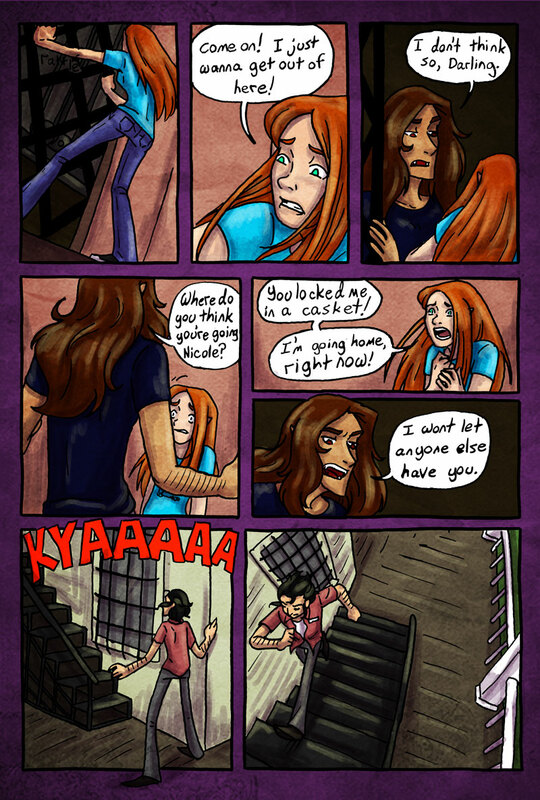 Also I finished inking the chapter the other day and colored a SP page. I’ve been remarkably productive since moving. I KNEW SOMEBODY WAS GONNA SAY THIS!!! Gabry needs an own theme. It looks like Gabry is taking 3 steps at a time. While he almost certainly is badass, it's not a prerequisite for taking three steps at a time. We've been known to go four at a time when in a big hurry (such as when the train is just pulling in), but aren't remotely badass. Why isn't this creep on fire yet!? :D I'm glad that things are getting better for you! I really want to help Nicole! BURN HIM. is it just me who see's this as "you're gonna get raped"? Also, you did an ace job of drawing Nicole here!